Louisville, KY (November 30, 2017) – Jefferson County student, Caroline Bates, was among the 12 students selected from across the state to display their agriculture science projects at this week’s Kentucky Farm Bureau (KFB) annual meeting in Louisville. 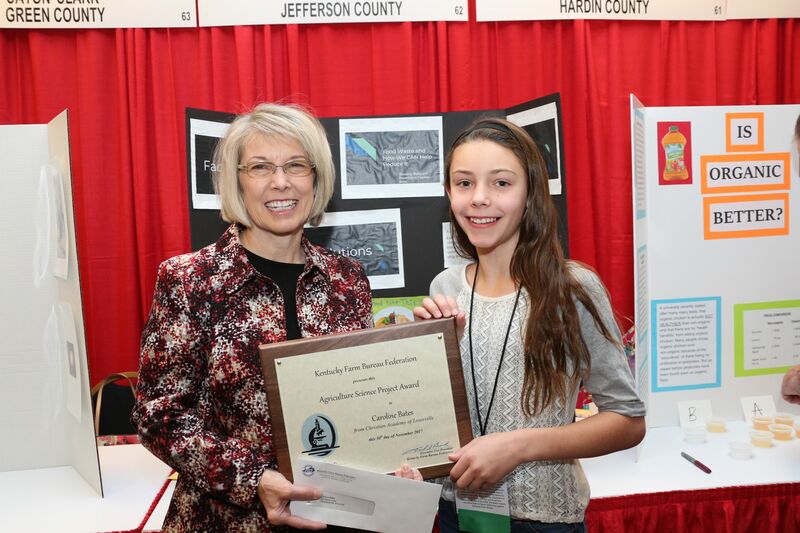 Caroline Bates of Jefferson County was presented with an award of recognition by Vicki Bryant, chair of the Kentucky Farm Bureau state Women’s Committee, for her participation in the 2017 Science in Agriculture program. Caroline displayed her science project as part of the KFB annual meeting tradeshow. Her project, “Food Waste Reduction,” explored how to reduce food waste to help the agriculture economy and environment. She was awarded $125.00 and a certificate of recognition for her participation at the state level.